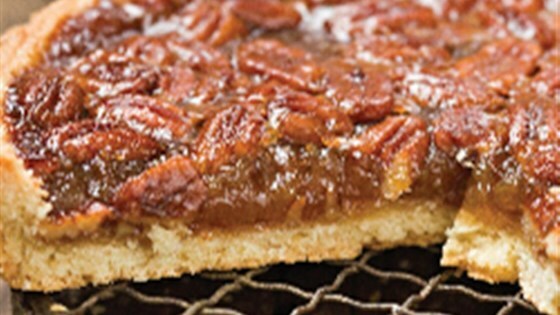 "This easy pecan tart can be served with whipped cream and extra pecans." Heat oven to 375 degrees F. Roll crust to 11 inches. Fit in bottom and up side of 9-inch tart pan with removable bottom. Trim edge. Bake 5 to 8 minutes or until beginning to brown. With back of wooden spoon, gently press out any bubbles. Meanwhile, in medium bowl with electric mixer on medium speed, beat Agave In The Raw and eggs until smooth. Stir in pecans. Pour into partially baked crust. Bake 20 to 25 minutes or until filling is set. Cool completely. If desired, garnish with whipped cream and reserved pecans. Tip: For a special garnish, reroll dough scraps. Cut out small leaves with 1-inch canapé cutter. Bake on small cookie sheet while crust is prebaking. Bake until golden brown. Garnish tart with baked pastry leaves.